This weekend the holiday season, including the Islay holiday season, kicks off for 2009. With the half term holidays having started today many families will go on holiday over the next two weeks, including a visit to Islay. In other words, now is probably a good time to publish the latest version of my Printable Islay Guide, the PDF guide to Islay. 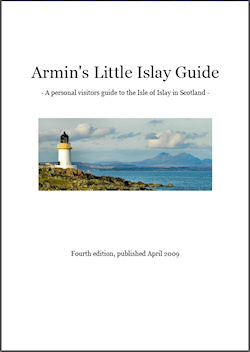 Looking back on how it has developed over the last two years I might have to revisit the name of ‘Armin's Little Islay Guide’ at some point: The first draft had 12 pages which turned into 22 pages when the first edition was published in July 2007. Since then it has almost doubled, via the second and third editions the fourth edition has now almost doubled to 39 pages from the initial 22. Not so ‘little’ any more, is it? The fourth edition, which you can download at the Printable Islay Guide page, has a number of updates and additions again. New restaurants and hotels were added, some outdated information removed or updated. I've added a new section about ‘IT, Internet and Islay Websites’. While the guide is mainly designed for offline use I thought in times of smartphones, laptops and wifi it might be a good idea to add a section about it. As before I'd appreciate any input and suggestions for improvements. While I don't have any timelines yet I'm sure there will be a fifth edition at some point. One option I'm considering is to add a few pictures on some of the pages, provided this doesn't increase the file size too much. So far there are no pictures inside the guide apart from the map. Do you think that's a good idea that will enhance the guide or will it just distract? Let me know what you think. If you're going on a holiday on Islay soon I hope you'll find the guide useful and most importantly have a great time. I'm off to Islay myself in a few days and will take it for a test drive myself.